Healthy home-made Spinach Bread. I had wanted to make this since I first tried spinach bread at our family Christmas dinner 2 years ago. One of my cousins brought a loaf from Singapore and I still remember the taste was buttery and texture was so soft. I Googled for recipes but they were mostly with garlic and cheese which wasn’t what I wanted. So, I came up with my own recipe and it turned out alright. I must say the bread is moist and soft but it probably needs just a touch more salt. Place all ingredients in the bowl of your stand mixer and knead for around 15 minutes until it had come together and become elastic . Gently punch down dough to release the air. Turn the dough onto a lightly floured work surface and shape the dough into rectangular loaf. Place the dough into square baking pan line with non-stick baking paper. Cover with plastic wrap or a kitchen towel and allow it to rise for another 45 to 60 minutes or until it doubles in volume. About 10 mins towards the end of proofing time, preheat oven to 375 degrees F (190 degrees C). Brush the dough with egg white/water mixture and sprinkle with poppy seeds . This is optional. Bake for 30 minutes or until top is lightly browned. Remove from oven and after 5 minutes remove from pan. Let it cool on the rack before slicing. The bread looks so beautiful!I must try to make this a 😀Have you ever tried this bread using tang zhong method? Thank you for dropping by. 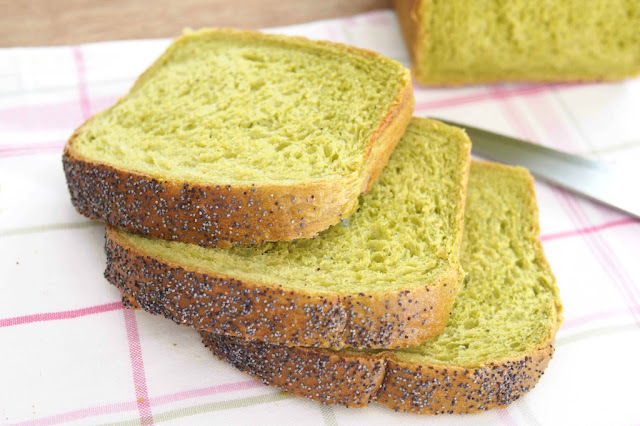 Yes, I have Spinach bread recipe using Tang Zhong method. You can get it from my baking book "Low-sugar Cakes and Bakes". Please let me know if you want the recipe. I can share here too. Thank you for your response. That's would be nice if you could share that recipe. 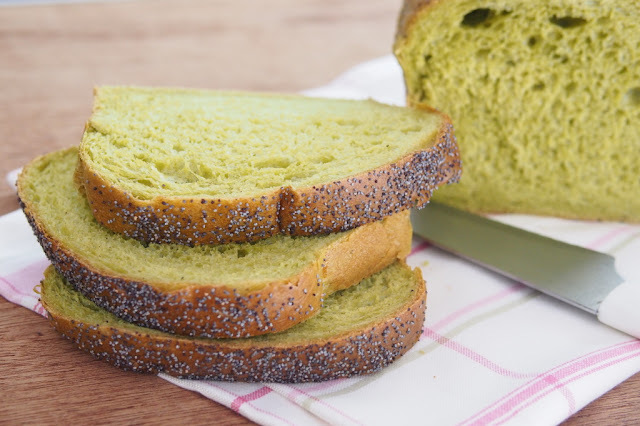 I've been looking for something like that to make for my son because he doesn't eat veggies but he loves green color 😊I found some spinach bread recipe online but the bread is so dense, not fluffy and soft for my son's liking. 1. In a sauce pan, combine flour and water. Mix with whisk or spatula until no lumps. 2. Cook over medium-low heat, stirring consistently until the mixture becomes thicker. Once you see some lines appear, it is ready. 3. Remove from heat and transfer to a clean bowl to let it cool. Tangzhong can be used straight away once it cools down to room temperature. It can be stored in fridge up to a few days The chilled tangzhong should return to room temperature before using. 1. Line the square pan with parchment paper. 2. Blend spinach and fresh milk together in food processor. 3. Add all ingredients (start with salt, flour, yeast, sugar, milk powder, oil, egg, spinach & milk mixture and lastly tangzhong) into the bowl of stand mixer. Using the dough hook on a stand mixer, knead until the dough comes together, become elastic and tacky but not sticky. Tacky dough behaves sort of like a Post-it note, sticking to a surface but peeling off easily. It takes around 12 - 15 minutes at medium speed. If the dough is too wet, add 1 tablespoon of flour at a time. 4. Let it rise in a warm place for 1 hour or until double in size in a large greased bowl, covered with cling film or kitchen towel. I normally leave the dough in the stand mixer’s bowl and cover with kitchen towel. 5. Punch down the dough to release the air. Transfer the dough to a clean floured surface then divide into 16 equal portions. Shape each dough into a ball. Place the balls in the prepared baking pan. Let it rise for another 45 to 60 minutes or until double in size. 6. Fifteen (15) minutes before baking, turn on the oven to 180C. 7. Brush with egg wash and top with cheddar cheese. 8. Bake in a preheated oven for about 30 minutes or until golden brown. 9. Remove from the oven and transfer onto a wire rack to cool. Thank you very much for sharing. Can'twait to try this on my day off. By the way is your cookbook for sale in US? Unfortunately, this book is only for sale in Malaysia and Singapore. By the way, the temperature and time duration are just as a guide. Please adjust accordingly to your oven.